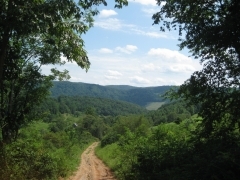 5.25 acres - A roughly cut in driveway leads you off of the 198 feet of paved road frontage onto this tract. The property is fairly gently sloping from the frontage to where a small, wet weather stream goes through the tract in a small valley. About halfway back, the property starts to rise up along the western property line. The property was logged a while back and has mostly young growth trees with scattered older ones here and there. A fair amount of limbs remain near the center of the property from the logging to clean up or let sit depending on your plans.